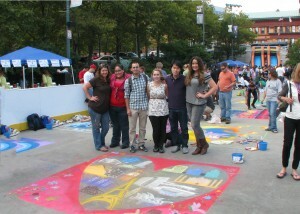 DI designers participated in the Providence Rotary’s Annual Street Painting Festial; benefiting organizations that enrich the lives of underprivileged children. Many gathered in downtown Providence for the cause, using art to help raise funds for the organizations. DiLeonardo’s piece was entitled, “Architecture for Humanity,” displaying select famous structures around the world.